Having just washed and conditioned my beard using a sample of the soon to be released soap from Scruff Stuff, I scraped out some ‘Chocolate Orange’ Beard Balm from Scruff Stuff and worked it into my beard. Although the balm is very firm (could be due to drop in temp) it soon warms in the palms of your hand and works easily into your beard. A subtle sweet Orange scent backed by a slight note of chocolate is perfectly done, but what else would you expect from James the guy behind Scruff Stuff who is a wizard at blending the scents. ‘Chocolate Orange’ Beard Balm from Scruff Stuff gave my beard a nice amount of hold and kept the stray hairs in check, however my beard still felt soft and natural despite the hold. The balm helps to also keep the beard looking good with a nice sheen and of course it helps to keep the skin under the beard in tip-top condition! A blend of Cocoa butter, Beeswax, Jojoba oil, Grapeseed oil and essential oils, using white beeswax which has less of a beeswax smell than yellow. The Jojoba oil is very good at helping to prevent acne and so will help stop guys shaving because of a spot! 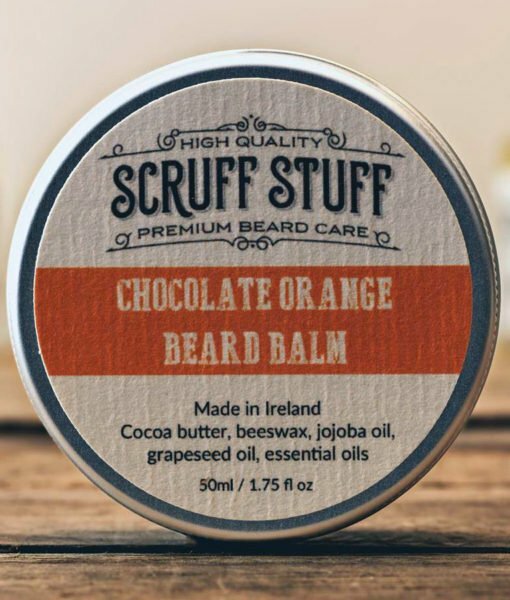 ‘Chocolate Orange’ Beard Balm is available from the Scruff Stuff website and comes in a 50ml/1.75 fl.oz screw top tin for £12.95. Scruff Stuff balms are also available in Chocolate Mint, Black Pepper & Bergamot and Unscented. Your face looks best when it’s rocking a full-grown beard. Every man should strive for this. It’s natural. Scruff Stuff uses 100% natural ingredients to soften and your tame beard hair and moisturise the skin underneath. Each product is expertly blended with essential oils for a subtle scent that smells great – but not strong enough to leave you smelling like you’ve just hit puberty and got heavy handed with the aftershave.